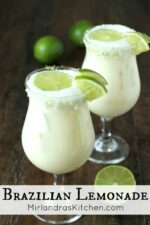 Brazilian Lemonade is a creamy, smooth, refreshing lime drink native to Brazil. This version is just like the one Tucanos Brazilian Grill makes! In honor of my 33rd birthday tomorrow I’m sharing one of my favorite drink recipes! Consider it my birthday gift to each and every one of you. I know that sounds a bit backwards but I always thought it would be lovely to be able to give gifts on your birthday instead of receiving them! Brazilian Lemonade sounds backwards too. It is called “lemonade” but there are no lemons in it – just limes. Don’t as me why – I haven’t the foggiest! What I do know is it is ridiculously good and that one drink will have you hooked for life. Sorry, but at least I warned you? Some versions of this recipe call for blending limes together with the water etc. I find that makes the drink bitter most of the time. My version is simpler and is dependably amazing. Have a great week guys, enjoy my birthday tomorrow and don’t wait to whip up a batch of this lovely lemonade to enjoy with friends! Tools In This Post: These awesome gadgets from Microplane are a good price and mine have held up for years! They make grabbing a bit of zest for cooking projects easy. I’m always juicing lemons, limes, oranges and grapefruits. Having a cheep and easy juicer like this one makes that job fast and easy. If you juice citrus fruit frequently get one of these! Heck, it is worth it just for the treat of fresh squeezed orange juice a few times a year. We are nuts about cool, refreshing summer drinks. 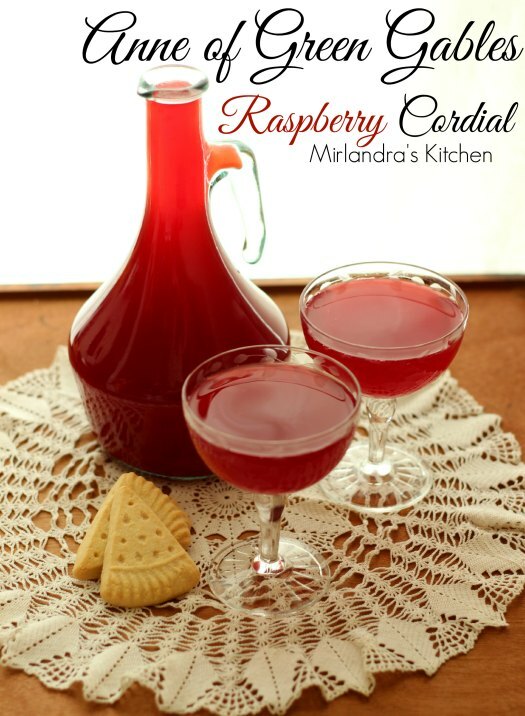 Another favorite of ours is my Anne of Green Gables Raspberry Cordial. Brazilian Lemonade is a creamy, smooth refreshing lime drink native to Brazil. This version is just like the one Tucanos Brazilian Grill makes! Measure 3 cups cold water and pour into a blender. Pour the other 3 cups of cold water into the pitcher you plan to serve in. Add the sugar, lime zest, lime juice and sweetened condensed milk to the blender. Holding the lid down firmly, blend the mixture until everything is combined and frothy. Pour contents of blender into the pitcher of water and stir to combine. Serve the drink in glasses of ice and garnish with lime wedges. Lime Juicing Tip: Use your hand to slightly flatten a lime against the counter or cutting board and roll it several times. This will help to release the juice. The ingredients sound like this makes a good drink. I’m confused about the instructions. Step #3 is a repeat of Step #2 and I didn’t see what to do with the 3 cups you put in the pitcher from Step #1. I’m so sorry, Angie – those directions were terrible! It looks like I grabbed my in process draft of the recipe instead of the final and put it in the post by mistake. Thank you so much for bringing that to my attention. I have fixed the directions. They should make a lot more sense now! If you have any more questions please let me know! Again I’m sorry about that. Thanks so much, Mirlandra!! Clearly, I’m interested in making this or I might not have read the instructions so carefully!! I’m sure I’m going to love this and thanks so much for posting it! What is on the rim of your glasses? Sugar? Salt? They look yummy! Thanks, Lisa! I used some lime zest mixed with decorating sugar like the kind you would buy for decorating cookies or cupcakes. It is a sparkly sugar that makes the rims beautiful! I have instructions for how to do that in my post for Watermelon Margaritas if you want more information. Enjoy! Sounds wonderful going to try this in may for our annual spring fling party, thinking of adding rum to it any thoughts? YUM! I think it could be great. My first thought is to use a lighter white rum – or even a coconut rum if you like that sort of thing. I would add it to one glass and see how you like the flavor before doing the pitcher. Depending on the type of party I would add 1-2 shots per 8oz of Brazilian Lemonade. In other words, what is known as lemon in Canada/USA is known as lime (“lima”, not to be confused with Lima the capital of Perú) in Latin America. And what is known as lime in Canada/USA is known as lemon (“limón”) in Latin America. So, they are right to call it “limonada”. Thank you! What a great explanation! I’m glad to know the details. You are very welcome and I’m glad it helped. The recipe sounds delicious and I hope to try it once summer makes a bit of a permanent status in my city. Cheers!